Aaron Rodgers, new head coach of the Packers? No, it's not happening. But a labeling gaffe by a Milwaukee TV station is worth at least a laugh. OK, Aaron Rodgers has obviously not taken over as the head coach of the Packers. But given Green Bay’s struggles so far this season — despite playing well Sunday, the Packers lost 29-27 to the Rams and sit at 3-3-1 through seven games — and some of the criticism the Packers QB has levied at head coach Mike McCarthy this year, a labeling gaffe by a Milwaukee TV station is worth at least a laugh. 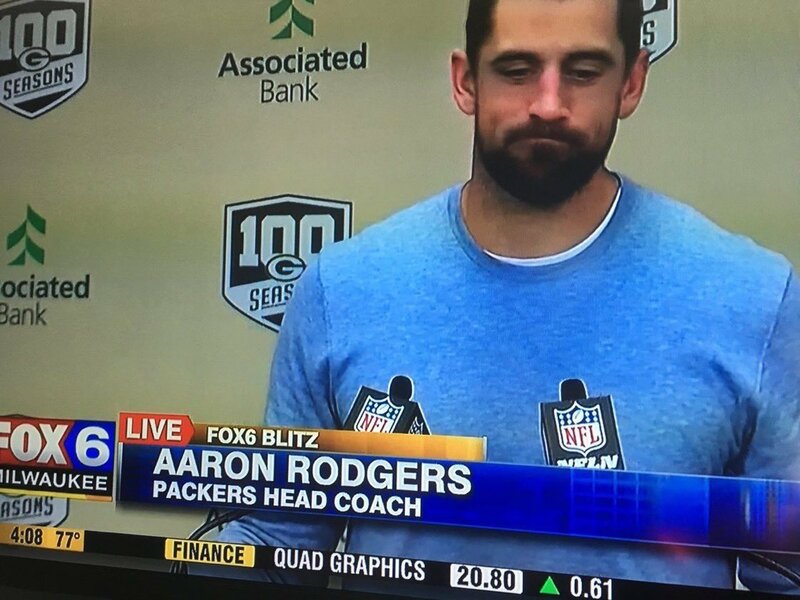 On the chyron during Rodgers’ postgame interview Sunday, he is labeled as the Packers head coach. USA Today’s For The Win had a look at some of the reaction from fans — many of whom seemed like they would support the player-coach concept over more McCarthy. NFL.com, by the way, has an interesting story bout how irate Rodgers and his teammates were about Ty Montgomery’s late fumble on a kickoff return against the Rams — when Montgomery apparently went rogue and was supposed to instead take a knee in the end zone. Hat/tip to the Twitter feed of local Fox 9 reporter Dawn Mitchell, where the gaffe was seen. Are Vikings losing their identity as a Zimmer-coached team?